To build lean muscle growth and prevent skeletal muscle breakdown from intense training, the best BCAA (branched-chain amino acid) supplement can be beneficial. Amino acids for muscle growth include leucine, valine and isoleucine. While these can be found in natural foods and in protein powders, they are usually found in much smaller amounts than in pro BCAA supplements. To optimize the muscle building effects of these amino acids (better known as branched amino acids or BCAAs), you may opt to take BCAA supplements instead. What to Look for in the Best BCAA Supplement? ​This powder contains ideal BCAA ratios, with added beneficial compounds such as glutamine and citrulline. Citrulline is an non essential amino acid that can help blood flow and is great for extra pump during workouts. ​This is a 100% pure amino acid BCAA supplement. It delivers a large concentration of BCAAs for greater gains. ​These easy-to-take capsules make BCAA supplementation more convenient. There is no unpleasant bitterness commonly associated with use of BCAA's in powder form. ​This is another BCAA supplement that delivers a large concentration of branched-chain amino acid supplementation. It does not contain any stimulants such as caffeine, making it good to take during any time of the day. What sets this product apart is its oligopeptide-enzymatic technology. The BCAAs are available to the tissues in bonded form for greater bioavailability. This may be considered as among the best amino acids if your goal is to get greater gains. This BCAA supplement is unique from the rest due to its free-form, micronized amino acids. It has caffeine in it, obtained from natural sources, i.e., green coffee and green tea extracts. This supplement comes is instantized form, which means that it instantly dissolves in liquids without forming any clumps. This BCAA supplement may help in stimulating protein synthesis more efficiently. This may help reduce fatigue and speed up muscle building and muscle repair. Get a large amount of BCAAs, at 7 grams per serving. The ratio of the 3 vital amino acids (leucine isoleucine and valine) is at the ideal 2:1:1, which numerous studies have demonstrated to be the most effective. These compounds help muscle tissues perform better, and for longer. They improve muscle performance, endurance, and strength. This formulation can help you get more out of each workout session. A blend of electrolytes is also added. Electrolytes keep the body well hydrated and aids recovery, especially during intense training sessions. The BCAAs in this supplement work as intra workout catalysts. These trigger certain processes that aid to build muscle and prevent breakdown. This supplement contains 100% pure powdered BCAAs. Purity is lab-tested and guaranteed. 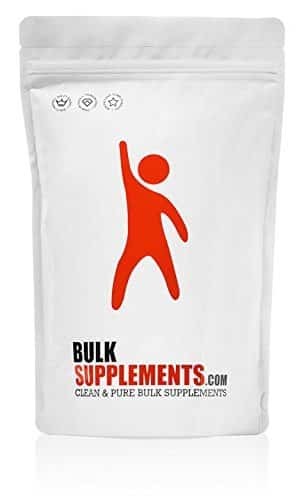 Each serving of BulkSupplements Pure BCAA is 1500 mg. Having one of the lowest prices on the market, this BCAA supplement provides a lot of value and is the best choice if you are on a slim budget. Mix 1,500 mg (roughly about ¾ teaspoon) of BulkSupplements Pure powder in liquid. Mix well before drinking. Take 3 times per day. You may opt to take more often or in larger servings. Be prepared for the bitter taste if you want to use more powder in each drink. The bitterness will be more difficult to mask even when mixed with other drink flavours if using more scoops per serving. The best time to take this BCAA drink is during workouts. ​For optimum benefit of bcaa, take BulkSupplements 30 minutes before any exercise. Each capsule delivers the ideal 2:1:1 ratio of the vital BCAAs leucine isoleucine and valine. These will protect the muscles from catabolism (breakdown) when you perform intense training. These amino acids also help build more lean muscle and enhances recovery after each endurance exercise session. Taking these capsules during strength training exercises may help kick start muscle protein synthesis. This is a vital process in muscle building. The recommended time to take this pre-workout supplement is between meals, before any workout or after training (30-45 minutes before or after). Each serving of BSN Amino X contains 10 grams of the important amino acids for muscle building and recovery. The BCAAs come in the ideal 2:1:1 ratio. This product also contains L-citrulline, L-alanine and taurine. All great additions to bring the benefits of this BCAA supplement to the next level. This is a caffeine-free product (stimulant-free). You can take this anytime whether day or night. The powder easily mixes with any liquid. There are no clumps that can destroy the smooth taste. Combine 1 level scoop of BSN Amino X with 6-8 oz. cold water or any preferred liquid such as a post-workout nutrition (post-workout protein) or gainer shake. Stir to mix well. Take 2 servings each day. This supplement from BPI features a cutting edge performance formula. This is designed to aid in building muscle and increasing strength. The formula may also help body fat loss and support muscle recovery/healing from muscle soreness. BPI Sports BCAA is created through a revolutionary process called oligopeptide-enzymatic technology. This process bonds the 3 main BCAAs leucine, isoleucine and valine, forming oligopeptides. In this form, the BCAAs may act as improved transport vehicles for enhanced metabolism, increased bioavailability and improved onset period of effects. This may translate to seeing results sooner than from using other BCAA products. This product is a good addition to bodybuilding programs. Most of these programs include periods with a calorie-deficit diet, which may end you up losing more muscle mass rather than building it. By taking BCAA during workouts, muscles gained are protected. This powder also contains CLA (conjugated linoleic acid). This ingredient helps burn belly fat. The energy produced may be used by the body to fuel muscle strength during resistance training. This makes it one of the best intra workout supplements. CLA will also increase your testosterone levels. This BCAA supplement contains 56 grams of free-form, micronized branch chain amino acids, with the addition of beta-alanine. Micronized amino acids are easier for the body to absorb. It also comes with 100 mg caffeine obtained from green tea. This supplement contains both green coffee and green tea extracts which will aid in burning fat while also maintaining muscle. One serving uses 2 scoops of powder. Each serving has about 5 to 10 calories and 100 mg caffeine. Mix the powder in water or any liquid of your choice. You may add more scoops if you want to increase the strength of the drink and provide my caffeine energy. This BCAA powder has been “instantized”. This process creates a powder that easily dissolves in liquid, even in cold water. The powder does not form into clumps or settle at the bottom of the glass, which is often the case with other BCAA products. Each serving of Optimum Nutrition BCAA Instantized Powder delivers 5000 mg of BCAAs. Prolonged endurance training will cause muscle catabolism. Amino acids may help protect muscle tissues from break down during endurance training. They may also help in promoting protein synthesis when taken during strength training. Mix 1 scoop in 6-8 oz. of your preferred liquid such as protein shake, juice or water. Take before or during endurance training as intra workout supplements. You may also take this before or during a strength training exercise. This BCAA supplement may help in stimulating protein synthesis more efficiently. This may help reduce central fatigue and speed up muscle recovery. The formula may also aid in faster fat burning, but make sure you also stick to a good workout regimen for maximum results. Sheer BCAAs comes with a 100% money-back guarantee. Take 2 capsules each day as a dietary supplement. BCAAs are helpful in your quest to build more lean muscle. However, you have to be careful when choosing a BCAA product because not all will give the benefits you might want. Some products may be a waste of money because these do not contain the necessary qualities or ratios of amino acids in order to be effective. Branch amino acids are not so easily absorbed by the body. You must look at the form that the BCAAs come in. Some amino acids will require longer digestion, which means that that they won’t be as efficient as others. Some of the supplements have enhancers thrown in. Check what these are. Some use enhancers for weight loss or for greater energy enhancement and pump, such as citrulline and glutamine supplement. Some have electrolytes for greater muscle contraction and recovery, as well as water and electrolyte balance. This is the main amino acid you have to place more focus on when you choose your supplement. In fact, this should have the greatest percentage of all the ingredients in the supplement. A ratio of 2:1:1 is the best. Go for supplements that do not skimp on the important ingredients i.e. amino acids. Avoid supplements with lots of fillers. Stay away from sugar. It is tempting for manufacturers to add some sugar into their supplements to make it taste better. Pure amino acids are bitter and that will sometimes throw off a lot of users. However, it is highly recommended to choose unflavored versions. The taste may not be that pleasant but at least you are better off in terms of health which is the main reason you are often taking the supplement to begin with. Sugar will overshadow many benefits you get from the supplement. Some flavored varieties do not use sugars. Look closely at the labels and do some extra research to look up how the product is flavoured. That way, you can make sure you aren’t getting more than the sugar you expect to. Sugar comes in many forms and if you spot anything that ends in –ose in the label such as sucrose and fructose, it is probably sugar and best avoided. Considering the features to look for, as well as the ingredients in the supplements in our list, we have determined the best amino acid supplement is Scivation XTEND. It delivers BCAAs in the ideal ratio of 2:1:1. This supplement requires a smaller serving size, which means fully packed and optimized servings. Moreover, it has excellent added enhancers, such as citrulline malate for better pump. This further improve the benefits that your muscles get when you train and during recovery. There is also the extra electrolyte blend that further support recovery from intense excercise. Electrolytes such as potassium are vital for effective muscle contractions. This electrolyte blend also helps restore and maintain electrolyte balance in the body. All these features make XTEND the best BCAA supplement. It has amino acids for muscle growth and other beneficial substances that enable you to make the most out of your training.